Like all Sri Lankans, I do love a good biryani, but invariably, biryani contains meat: beef, chicken, lamb, mutton. Here, in Sri Lanka, chicken and mutton biryani is the most popular, and my vegetarian friends invariably make do with eating the rice and the usual accompaniments such as raita and mint/ coriander chutney. There are plenty of vegetarian style biryanis out there: mushrooms, mixed vegetable… even vegetable pilaf. However, its rare to find a biryani solely catered to the vegetarian, or even vegan palate here. Now, don’t get my wrong, I love my meat as much as many of you out there, but I wanted to try something different for a change, and eventually if it was good enough, then I could make it for my vegetarian friends, who wouldn’t have to worry about picking the meat away. That is, if they were okay with eating the rice from a meat biryani. So I browsed through my trustworthy Pinterest for recipes and I came across a fair few. Lots of different recipes out there for all your vegetarian biryani lovers. 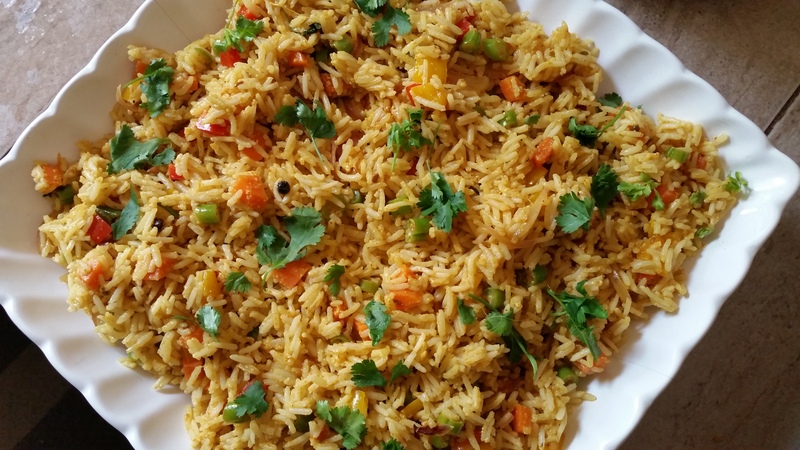 Try out these recipes: Hyderabadi Vegetable Biryani by The Veggie Indian, Paneer Biyani by Crave Cook Click and Kashmiri Veg Biryani from Veg Recipes of India. Now, I adapted this recipe for Pakistani Shahi Pullao for my version of vegetarian biryani. I also used Shan Pilau Biryani (pictured below) mix for the masala flavour. Wash and cook the basmati rice and leave aside. In a pan, heat the oil and saute the onions and ginger and garlic paste. Add in the diced carrot and cook, until tender. Add in the chilli flakes and biryani masala. Then add in the peas, peppers and paneer and mix well. Add salt to taste. Add half the coriander into this. Once, all the veggies and masala are combined well, lower the heat, add in the cooked rice and toss together. Serve into a large dish and garnish with the remaining coriander. Serve with raita and mint chutney (or accompaniments of your choice). I loved how colourful the biryani was with the peppers and veggies. The flavour was spot on as well and my family loved it! So yayy to that!